Handsome Hubby likes to go hunting. Deer hunting in particular. That means I need to learn how to cook Bambi venison. Fat imparts flavor to most meat, but in venison, fat imparts that game-y flavor that most of us don’t care for. So when HH gets a deer, I am always happy when he has the butcher make up a lot of ground venison. I make spaghetti sauces and Venison Chili. This recipe really is pretty easy to throw together. It’s also very forgiving. Alter the amounts, add or take away ingredients… whatever floats your boat. Dice a large yellow onion and saute in a large stock pot with a little olive oil. 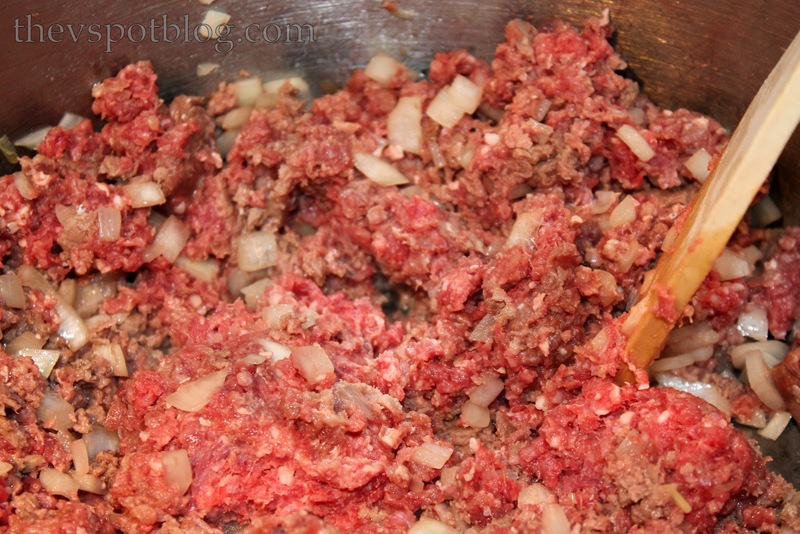 While the onion is sauteing, add in the ground venison and 2 cloves of minced garlic. Mix it all together and brown the meat. 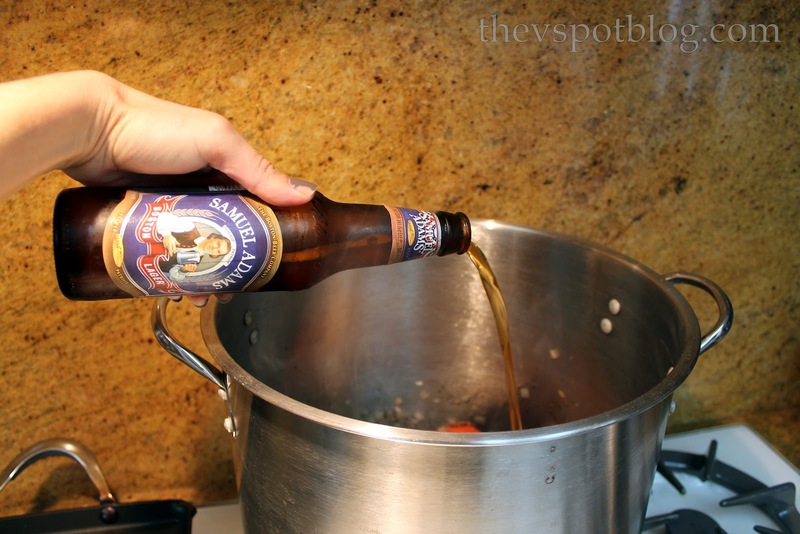 This helps to really impart some flavor to the venison. 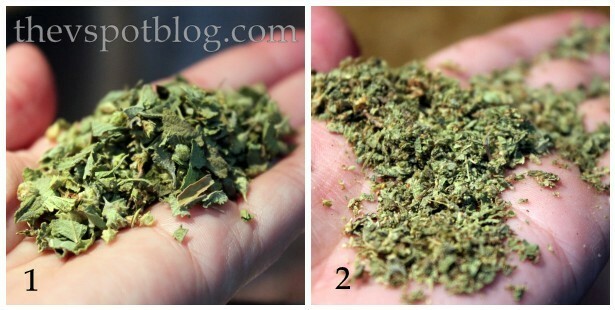 While the venison is browning, take a big handful of dried oregano and rub it between your palms so that it breaks down and crumbles into a powder. Heck, add two big handfuls if you feel like it. Next, grab yourself a chili brick. You can get these in the deli/refrigerated section at the grocery store. At our store they are near the hot dogs and the cream cheese. (But my store is kind of odd.) If you don’t see it, ask. I swear by this brand, but I am sure there are others out there. Yes, yes, I know that true chili doesn’t have beans in it. However, we like it that way, so I add in several cans of drained pinto beans. (I also added in 2 cans of canary beans this time.) You can add whatever kind of beans you would like. I add in a whole, undrained can of diced tomatoes too. Once I get it simmering, I dump in a whole jar of my favorite salsa. 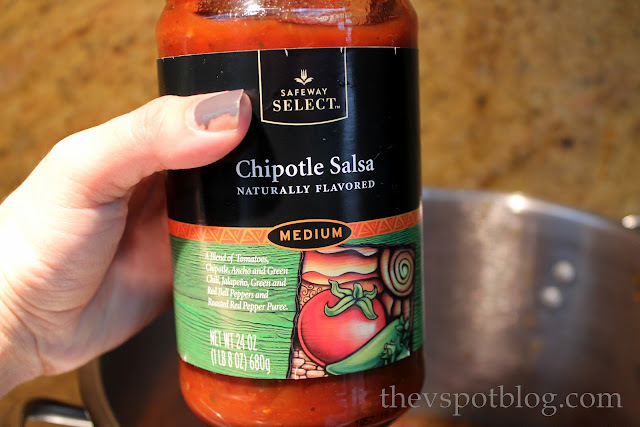 I do make my own, but I happen to love the chipotle flavor of this one. Then I add in a big chunk of chopped cilantro. In this case I used one of my pre-chopped frozen portions of cilantro. Serve up and add whatever toppings you like. I love cheese, sour cream, chopped cilantro, diced tomatoes, onions and avocados on mine. Oh! And crushed tortilla chips. It’s a good thing that the venison and the beans are so low in fat, because I make up for it with the dairy and the chips I pile on top! Yum! 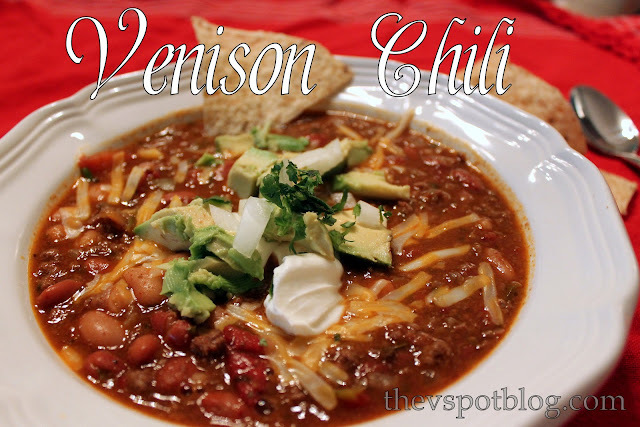 What do you put on your chili? Fisherhubby likes to deer hunt too – – – but when he brought home all the butchered meat, he didn’t LIKE IT AT ALL. The only part we like is the back strap or tenderloin. Hardly worth getting a deer. So this is my new rule: NO MORE VENISON. I mean, if the hunter HIMSELF isn’t gonna eat the stuff, I’m NOT GOING TO slave away over it in the kitchen! BTW – Chili con Bambi is pretty hilarious. You may get PETA types upset, but you made me choke and laugh. This looks really yummy! 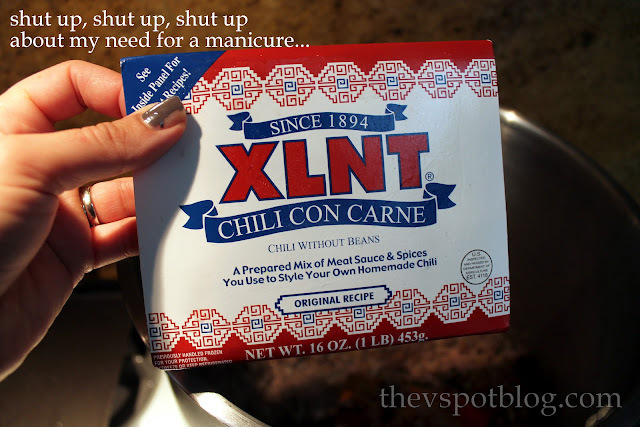 No beans in chili…I always put bean in??? I didn’t know that true chili didn’t have beans. I love cheese and sour cream on top of my chili too…with a side of chips. This looks VERY good. We usually add hominy to all of our chili recipes. Thanks for sharing! All meat gets its flavor from what the animal eats, adrenaline and other hormones, and how it is processed. It makes a difference how good the kill was (gut shot or animal running can make for very gamey meat). Deer taken from areas high in corn/grasses are tastier (thick grass-fed beef) than those taken in areas where they browse more shrubs/pines/etc. A great processor makes a big difference. Vacuum sealed is better than the old paper wrapped. Trim as much tendon/fat off as you can. All those little things can help greatly with the taste – people who come to my house don’t usually even realize its not beef they are eating. I love beans in my chili. Bambi is optional. Minus the manicure. HAHAHA. Just kiddin’! I don’t think I have ever eaten Bambi 😉 I have had cow’s tongue but not venison- weird. Recipe looks awesome! I’ve cooked deer for years. We love it in everything at our house. 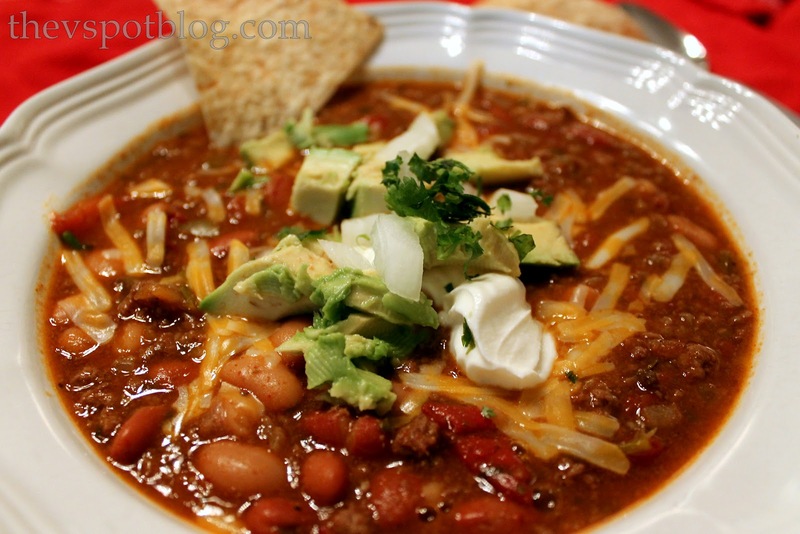 I make my chili and put the deer in raw, it soaks up the flavor of whatever it is cooked in. I got the tip from a woman that was cooking it before I was born. Best chili ever! !